Note: This post is less of an instructional "how to bootstrap your own hackathon" and more of a historical summary and lots of shout-outs. But feel free to take any useful bits or get in touch about the former. PennApps offered me a fantastic first large hackathon experience, and we're hoping to try and replicate that experience at RIT going forward. Wow. Even when we first got started with codeRIT we didn't plan to make anything bigger than a ~50 person hackathon1 by the end of spring 2015, if that. The main plan was to set up a team of RIT students we could bus out to hackathons every weekend. Maybe get jerseys and flags and propel RIT into the hackathon community. And yet, my wishful self wished for a hackathon at RIT. This is the story of how it happened. Somehow PennApps Spring 2014 got onto my radar. I had been undergoing an identity crisis of whether games or the web would be my future, and that hackathon gave me a chance to play around with my web side. The promise of free travel and food and programming was too good to pass up. And boy did the team at UPenn deliver. Hackathons should have "hack" in the name. We started back up in the fall in high gear. 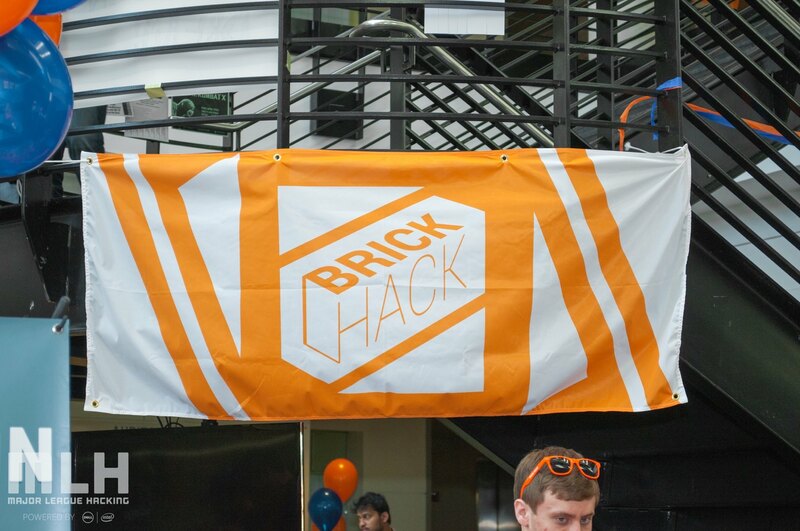 Before our first group meeting we met to brainstorm a hackathon name and landed on BrickHack6. During our first meeting, we had a surprise showing of a few freshman who had no business knowing that we existed, ready to help out in whatever way they could. 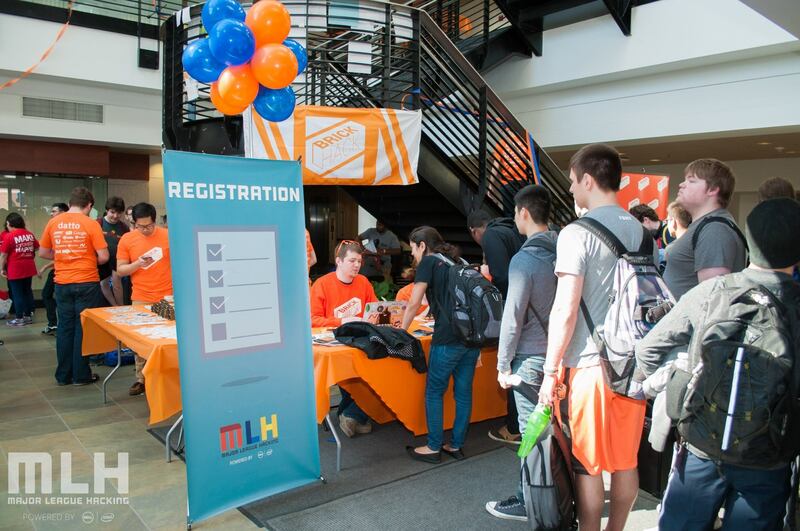 One of those freshmen, Stefan Aleksic, had been trying to organize a small hackathon for incoming freshmen and worked with Ben Cohen, RIT hacker extraordinaire, to try and get it going. Stefan's plans didn't work out, but we managed to get him and some of his new friends on-board for BrickHack. We also gained Jen Lamere, who had helped organize WiC Hacks the year prior. 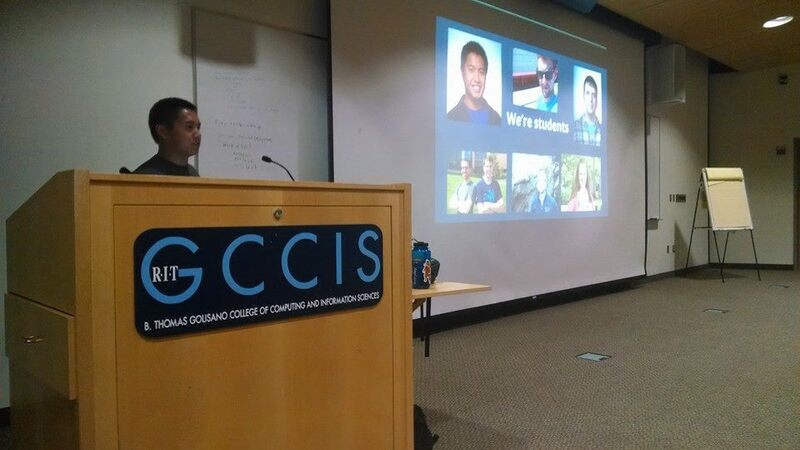 We held a public codeRIT meeting a couple weeks into the semester. We hoped it would drive awareness of the RIT hacker team we still wanted to build, as well as act as a recruitment campaign for anyone interested in creating a hackathon. As appears to be the trend in this story, the event worked better than expected and we had 29 people volunteer to join the group. With all the success on the hackathon creation front, we nearly forgot the original goal of codeRIT was to attend hackathons. However, by the end of the semester all of the organizers had attended at least one hackathon. I did a hat trick of hackathon weekends, attending PennApps X, Software Freedom Day at RIT, and Big Red Hacks. By sending codeRIT members to hackathons, we grew awareness among other RIT attendees and made connections with the organizers at other schools. Hands down, the largest problem we dealt with in the fall was locking down a date and a venue. There is no sage advice to share after going through that experience. We were a student-run group that had deliberately avoided being an official RIT club, we had never hosted a hackathon before so we had no prior credibility, and apparently we tried to book a venue too late7. Finally out of pity we were granted GCCIS, which worked out really well in the end. My own efforts were small, but I am likely the most qualified to write about them. At the beginning of the semester we created an organizational structure, and for some reason I ended up being told to lead the Travel & Outreach team8. This manifested into budget planning, bus route planning, and speaking with organizers about how they planned their events. I made sure to dodge the bullet of implementing those plans and graduated in December, but thankfully Stefan Aleksic, Brandon Nieves, and Velizar Demirev were able to pull through and get it done. One event I am happy to have helped with was the initial shakedown begging for money at the fall Career Fair. Brandon led the Sponsorship team at the time and invited Colden and I along since we had jobs lined up and didn't need to use the career fair for its intended purpose. We knocked on Google's door first because Brandon knew the recruiter and why wouldn't they want to sponsor? Of course we got the hardest questions with answers we hadn't yet come up with, leaving us dead in the water. But we rebounded with a couple easy wins from Microsoft and Apple9, and the smaller companies were so engaging. A lot of them were just happy to have someone to talk to that didn't require a sales pitch about their own company. In an unexpected turn of events, the Staples representative responded with such enthusiasm that we left the booth with a heaping pile of swag and they ended up being one of the biggest sponsors. From the time I graduated to the big event on April 18-19, I basically had no more contributions. Returning for that weekend was an incredible victory lap. We had more than 300 hackers attend, roughly half from outside schools. BrickHack was on the Major League Hacking Spring 2015 roster and the Democrat and Chronicle wrote an article about it. A couple news stations aired evening segments. But most importantly, the feedback from hackers and sponsors throughout the event was very positive. Of course there are things that went wrong or could have gone better, but the trailblazing hackathons at other schools gave us a model for success even in round one. I didn't set out to make a big successful hackathon. Nor did I. All I did was spend 3 years hanging around other people who get stuff done and convince them that this was worth doing. Most of the early codeRIT team hadn't even attended a large hackathon before they began planning one10. Half of us were planning to graduate in the fall, and even with senioritis the train kept chugging forward because of the dedication that team has. Now I get to look forward to the future of this event, hopefully for years to come. Maybe one day they'll shell out some money to bring me back like we did with Gregory Koberger, the creator of RIT48 among many other things. Never did I imagine this being a part of my legacy at RIT, but I'll take it.